The summer months mean the Dutch say goodbye to gloomy skies and hello to better weather. 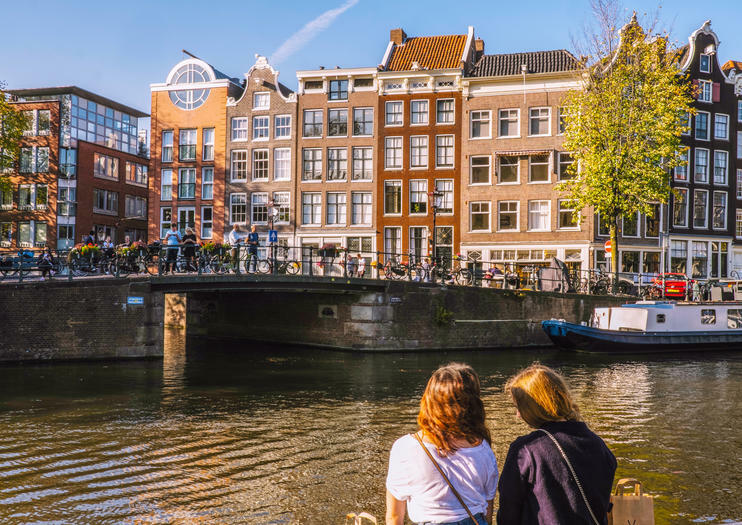 Travelers looking to make the most of a summer trip to Amsterdam will find a number of ways to dig into the city's culture and history—here are our top picks. Take it easy on an open-top boat cruise along Amsterdam's famous canals. Rent a bicycle and pedal around the city streets like a local. Board a hassle-free hop on, hop off bus or canal tour that allows you to see Amsterdam's most popular attractions while avoiding navigating the streets on your own. Explore the Jordaan district to discover charming cafes and restaurants or picnic among the flowers in the Hortus Botanicus. Venture out on a tour of the Dutch countryside, where you’ll find culture, tradition, and the famous Dutch windmills just beyond the city. Get the most out of your Amsterdam stay — and save money — with the I amsterdam City Card. With this pass, you enjoy unlimited free public transport, a free canal cruise and discounts on attractions and restaurants. Plus, gain free entry to 44 museums including the Rijksmuseum, the Rembrandthuis Museum, Van Gogh Museum (with time slot booking option) and Hermitage Amsterdam. Use your pass to discover this marvelous city at your own pace! Combine two Amsterdam essentials in one day with a canal cruise and skip-the-line admission to the Heineken Experience. Board a comfortable boat and admire the sights along Amsterdam’s UNESCO World Heritage canals on a 75-minute cruise. Waft by lovely canal houses, bridges and churches; and savor this delightful quarter from the water. Complement your cruise with fast-track entry to the Heineken Experience at the beer’s former Amsterdam brewery. See the vintage brewery equipment and learn about the production process on an interactive journey that finishes with a free beer tasting. Visit Amsterdam's culinary hot spots on this 2.5-hour food and walking tour. Alongside your guide and small group, limited to just 12 foodies, travel around town to taste popular local dishes such as salty fries and fresh herring. Sample pungent artisan cheeses, and throw back a house spirit at a 17th-century distillery. Along the way, gain insight into Amsterdam’s gastronomic roots and the historic Dutch spice trade. Explore Holland’s vibrant capital with an Amsterdam and Holland Pass. Enjoy free and discounted admission to top attractions and museums, as well as convenient skip-the-line entry to the Keukenhof Gardens, Madame Tussauds, and the Rijksmuseum. For a completely authentic dining experience in Amsterdam's trendy Oud-Zuid neighborhood, head to the home of local chef Simon for a private, homemade meal. Enjoy three to four courses showcasing seasonal ingredients and the diverse flavors of Dutch cuisine, each expertly paired with wine. Dine family-style around a welcoming table, and experience true Dutch hospitality that can’t be matched in any restaurant. Relish the rich artistic heritage of Amsterdam on a private walking tour of sites associated with painting pioneer, Rembrandt van Rijn. With an expert guide, delve into the life and works of the influential artist while sites integral to the painter's life and work. Discover the exhibits within the Rembrandt House Museum, the former residence in which many of his masterpieces were painted, and then tour the iconic Rijksmuseum to see some of Rembrandt’s most celebrated paintings. Receive the undivided attention of your guide on this private tour, the itinerary of which can be adapted to suit your interests. See remarkable music in one of Amsterdam’s most iconic venues with tickets to Robeco SummerNights at The Royal Concertgebouw. Choose between classical performances, intimate club-style jazz, romantic chansons and soaring film scores performed by top musicians from around the world. Select one of over 80 concerts in July and August, and experience a festival that’s delighted audiences for 30 years.